How to Create an Impressive-Looking Focal Wall For Your Living Room – Lundberg Builders, Inc. The living room is perhaps the most important room in your home as this is where you get to relax and spend quality time with your family. Many people spend a lot of time and money to make sure that their living room looks great, and designers often recommend investing in the living room if their client is on a tight decorating budget. One of the best things that you can do to refresh your living room is to create a focal wall, and depending on your preferences, your accent wall can be functional or decorative, or even both. Here are 5 ways that you can create an impressive-looking focal wall for your living room. Barn walls or reclaimed wood, both real and faux, is immensely popular in home décor. Not only does reclaimed wood give your focal wall a warm and weathered look, but using this material will not harm the environment as it is a sustainable material for construction or remodeling. 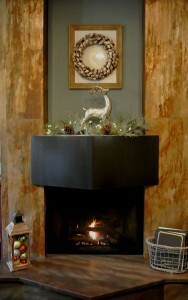 Have your builder cover your accent wall with reclaimed wood for a rustic look. Nothing is as luxurious and comforting as a fireplace in a living room. If you don’t care for a wood burning fireplace, consider embedding an ethanol fireplace insert in your living room focal wall. This type of fireplace will bathe your living room in warmth without smoke, bad odors, or particles that can be harmful to your health. According to the Environmental Protection Agency, the smoke from wood burning contains particles that can cause health problems such as a runny nose and bronchitis. 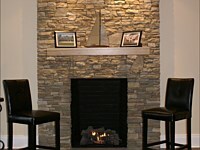 As an ethanol fireplace only need bio-ethanol fuel to feed the fire, it’s safer for your health than a regular fireplace. If you want to display your books and collectibles, consider having built-in shelving room as a living room accent wall. You can either paint the accent wall and all the shelving attached to it the same color, or paint the shelving in white and the accent wall a bright color, like yellow, turquoise, or red. To make a stylish statement, paint your accent wall in a dark color, such as navy blue, then hang a few decorative wall mirrors once the paint dries. Try to find mirrors with golden accents to give your living room a touch of opulence. These are just a few ways to create an impressive-looking focal wall for your living room. Any of these tips will give your living room that wow factor that your family and friends will surely love.